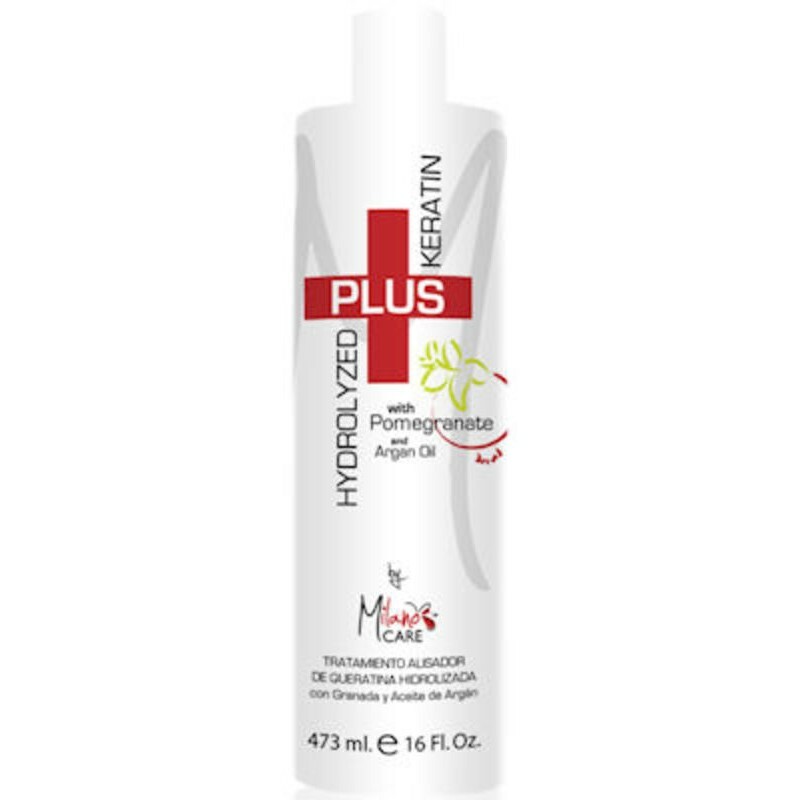 Milano Care Hydrolyzed Keratin Plus with Pomegranate 473ml/16oz - Just Beauty Products, Inc.
Milano Care Hydrolyzed Keratin Plus with Pomegranate 473ml/16oz. Is a unique and innovative hair smoothing treatment able to eliminate frizz and curl even for the most resistant hair types. Keratin Plus by Milano Care: is a unique and innovative hair smoothing treatment able to eliminate frizz and curl even for the most resistant hair types. The Pomegranate infusion nourishes hair with vitamins and antioxidants leaving the hair looking soft, shiny and luxurious with immediate results. Collagen, protein complex and organic botanical and Argan Oils guarantee manageability and easier to maintain hair, reducing daily styling time up to 80%. For many, this is truly a life changing experience! Wash hair twice with Milano Keratin Clarifying Shampoo. Towel dry hair. Make sure hair is dry to continue with next step. Using a brush section hair into 3 parts. Apply Keratin PLUS Smoothing Treatment with application brush onto 1/2 inch of hair layer by layer 1/2 inch away from scalp. Apply the product to he hair and distribute evenly to the ends. Removing excess with a comb. Do not apply directly to scalp. Let the treatment set for 20 minutes. Blow-dry hair thoroughly until hair is 100% dry. Set iron at 450ºF if hair is not damaged and 380ºF is hair is moderately to severely damaged. Iron each lock of hair, pass the iron through the same lock 6-8 times as needed. Repeat the procedure for the remaining sections. Clients could wash hair at any time after the treatment. Caution: This product is for professional use only and to be used by a licensed and trained stylist. It contains formaldehyde. It may cause eye, skin and/or breathing irritation to certain individuals and a preliminary test strand is recommended. If irritation occurs, please discontinue use and seek medical advice. Keep out of the reach of children. Do not take internally. Disclaimer: Manufacturer / Distributor is not responsible for damages or injuries if product directions and caution statements are not followed.